Beautifully presented starter home! Complete with three double bedrooms, a brand new kitchen, bathroom and utility room, this excellent family home offers off road parking and no onward chain. Complete with front and rear gardens and elevated views across the area. SUMMARY Beautifully presented starter home! Complete with three double bedrooms, a brand new kitchen, bathroom and utility room, this excellent family home offers off road parking and no onward chain. Complete with front and rear gardens and elevated views across the area. LOCATION Mannadon is located in central Plymouth and gives access easy access to the A38 Devon Express Way and Tavistock Road. Mannadon has a range of local primary and secondary schools, plus local bus routes and amenities nearby. The world famous Plymouth Hoe and Historic Barbican are only a short commute away, which offers a wide range of local and national shops and restaurants. Plymouth is also home to The Royal William Yard and is on the doorstep of Dartmoor. DESCRIPTION Entering into the property into the hallway via an uPVC door, the hallway leads into the kitchen and has stairs to the first floor landing. The hallway has a wood effect laminate floor, with storage space underneath the stairs. The kitchen has a brand new kitchen installed, with a wall and base mounted unit and a roll work surface over, an integrated electric oven and a ceramic hob. There is a stainless steel sink drainer unit, and subway style tiled splashbacks. The kitchen is finished with a wood effect laminate floor, and gives access into a utility room, rear garden and into the lounge/diner. The lounge/diner has dual aspect views over the surrounding area and gardens and is neutrally decorated. It is of a good size and a great entertaining space. The utility room has space for a range of white goods, and is a great storage space. Upstairs, there are three double bedrooms, plus the family bathroom. The master and second bedrooms have elevated views across the area, and are tastefully decorated. 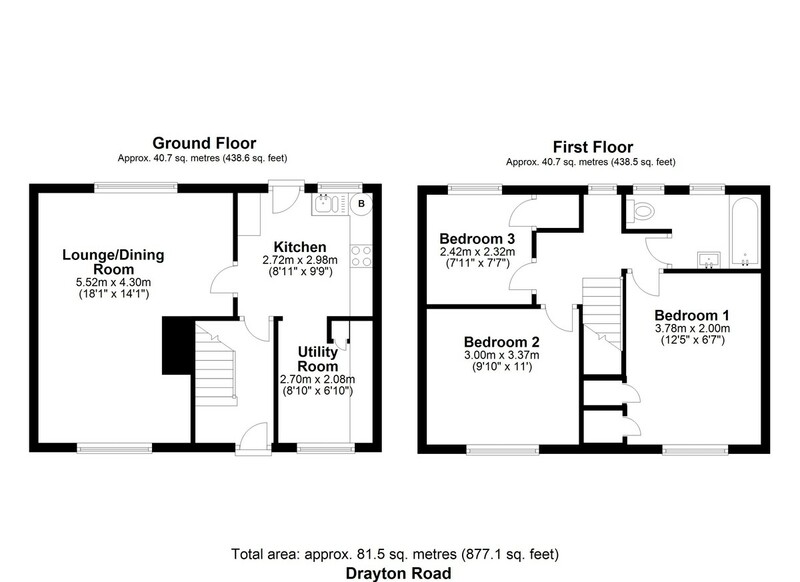 The third bedroom is at the rear of the property and overlooks the rear garden and has a built in storage cupboard. The family bathroom has a low level w/c, hand wash basin and panelled bath with a shower overhead. The bathroom is fully tiled from floor to ceiling and has a heated towel rail. OUTSIDE Externally, the property has front and rear gardens which are mainly laid to lawn. The front gardens have a selection of matures shrubs for boarders and the rear gardens are tiered and fully enclosed. There is off road parking for one vehicle. Services – Mains electricity, water, gas and drainage.